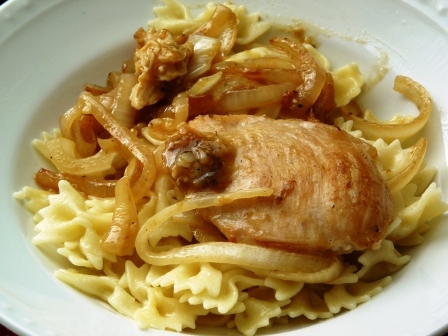 Lemony mushroom chicken is a quick 30 minute meal. You can jazz it up by adding a few tablespoons of capers or cilantro. You can even omit the mushrooms. In this recipe you will learn a simple technique called deglazing to make the sauce. Deglazing is used a lot in cooking to create sauces/gravy or to add rich flavor to soups or meat. You know that crusty stuff on the bottom of the pan from grilling meat? The stuff you can never get off? When you add liquid to the hot pan you can easily scrape the bits of charred meat off. This is called deglazing. This broth that is formed is chocked full of amazing flavor that will transform a flavorless soup into something mouth watering. Deglazing is also the first step in preparing gravy for Thanksgiving dinner. Once you conquer deglazing feel free to play around with the flavors by adding different types of juices or cooking wines. Try butter and garlic for a garlic sauce with roasted veggies. In a large skillet, heat the olive oil. Sautée the onions until translucent about 8 minutes. Add the mushrooms and sautée until soft about 7 minutes. Remove the onions and mushrooms. This next step is optional. If you dredge (meaning to coat) the chicken in the flour now then you do not have to add flour when making the sauce. Dredge the chicken pieces in the flour until they are coated well. Add oil to the pan if necessary. Place the chicken pieces in the skillet; cook over medium heat until no longer pink in the middle about 3 minutes each side. Remove from pan. Add chicken broth or wine to the hot pan scraping up the burnt bits on the bottom of the pan. If you did not dredge the chicken in the flour add 2 tablespoons flour now, whisking until completely dissolved. Continue to cook the sauce over medium heat until it starts to thicken. Remove from heat. Place the mushrooms, onions and chicken back in the pan and toss. Serve over noodles or other favorite grain or with roasted vegetables or squash. Whenever I am in the mood to cook Italian I always turn to my favorite Napa Valley Chef, Micheal Chiarello. His recipes are always clean and full of flavor. This recipe for Potato Gnocchi does not disappoint. Gnocchi [pronounced ‘Nyoke-ee’] is a type of dumpling made from semolina or wheat flours or starchy potatoes or sweet potatoes. It is not uncommon to find recipes that mix part potato with squash or spinach. Gnocchi are to the Italians what french fries are to the Americans. Everyone loves them. The dough is so light and fluffy it is like biting into a cloud; they practically melt in your mouth. Gnocchi was first introduced by Roman Legions during the expansion into Europe. It was a quick cheap side dish favored mostly in Northern Italy but now is enjoyed throughout the Middle East and South America. Now, for the important part: the tips of trade for making perfect gnocchi. Michael prefers to bake the potatoes. It is perfectly fine to boil the potatoes however you must follow these important guidelines. 1. When boiling the potatoes for potato gnocchi you want to cook the potatoes WHOLE with SKINS ON. If you peel and cut the potatoes before boiling they will absorb too much water resulting in mush. 2. Do not over cook the potatoes. Test the potatoes by piercing one with a fork or knife. If it is hard then it needs to cook longer. A fork should be able to insert easily and the potato slowly slip off. (About 30-45 minutes) Lay the potatoes on a board or towel to cool slightly before peeling. 3. Use a potato ricer or push the cooked potato through a strainer. Mashing the potatoes creates mashed potatoes. Gnocchi begins as a light dough. Pushing the potatoes through a strainer or ricer is what gives the gnocchi the airy texture. The dough should be gently handled similar to when making biscuits or pie crusts or even meatballs. Everything is folded in mixing until just blended. This is not a pasta or bread dough so avoid kneading the dough too much. Add the flour a little bit at a time until the dough holds together. Do not add too much flour. Once the dough is ready you can either cut the dough then cook or shape the cut pieces using the tines of a fork. The indentations created by rolling the dough on the fork is key to holding the sauce. The end result? Absolute heaven. There are many ways to serve gnocchi. Be sure to scroll to the bottom of the recipe for delicious ideas. Click here for a step by step tutorial from making the dough to rolling them. Spread a layer of kosher salt on a baking sheet and arrange the potatoes on top (see Cook’s Note). Bake until a bit overcooked, about 45 minutes. Let sit until cool enough to handle, cut in half, and scoop out the flesh. Reserve the potato skins, if desired, for another use. Pass the potatoes through a potato ricer or grate them on the large holes of a box grater. You should have about 2 cups. Make a mound of potatoes on the counter or in a bowl with a well in the middle, add 3 of the egg yolks, the cheese, nutmeg, salt, and pepper. Mix in the potatoes and mix well with hands. Sprinkle 1/2 cup of the flour over the potatoes and, using your knuckles, press it into the potatoes. Fold the mass over on itself and press down again. Sprinkle on more flour, little by little, folding and pressing the dough until it just holds together, (try not to knead it.) Work any dough clinging to your fingers back into the dough. If the mixture is too dry, add another egg yolk or a little water. The dough should give under slight pressure. It will feel firm but yielding. To test if the dough is the correct consistency, take a piece and roll it with your hands on a well-floured board into a rope 1/2-inch in diameter. If the dough holds together, it is ready. If not, add more flour, fold and press the dough several more times, and test again. Keeping your work surface and the dough lightly floured, cut the dough into 4 pieces. Roll each piece into a rope about 1/2-inch in diameter. Cut into 1/2-inch-long pieces. Lightly flour the gnocchi as you cut them. To shape use a gnocchi board or the tines of a fork turned upside down. Rest the bottom edge of the gnocchi board (or the back of a fork) on the work surface, then tilt it at about a 45 degree angle. Take each piece and squish it lightly with your thumb against the board while simultaneously pushing it away from you. As you shape the gnocchi, dust them lightly with flour. When ready to cook, bring a large pot of water to a light boil and add salt. Drop in the gnocchi and cook for about 30 seconds from the time they rise to the surface. Remove the cooked gnocchi with a skimmer, shake off the excess water, and serve as desired. – Baked Gnocchi: Prepare gnocchi as directed above. Meanwhile heat 2 tablespoons butter in a saucepan over low heat. When melted stir in 2 tablespoons flour until smooth. Slowly add 1 cup milk whisking until smooth. Continue to heat sauce until slightly thickened about 5 minutes. Then add 3/4 cup shredded Parmesan cheese. Stir until blended. Season with salt and pepper. Place cooked gnocchi in a casserole dish. Pour sauce over gnocchi. Bake at 400 degrees for 10-12 minutes. – Sprinkle gnocchi with 1/3 cup shredded Parmesan cheese then drizzle with 1/2 cup heavy cream. Bake in a 400 degree oven for 10-12 minutes. – Simmer gnocchi in chicken stock with chopped celery and carrots to make dumpling soup. Garnish with chopped scallions. – Heat 3 tablespoons butter over medium heat until slightly browned. Toss with gnocchi. – Serve Gnocchi with marinara sauce. – Use in the place of pasta. I have always loved spicy food. I thought I could handle heat that is until at Seventeen I traveled cross county to Texas. The salsa there was so hot my mouth was inflamed for the rest of the day. I dared not eat another lick of the stuff the remainder of my visit in Texas. Upon my return home I remained adverse to hot spicy foods for sometime. Years later I returned to Texas. It was there I learned from many friends how to cook some of my most favorite Mexican dishes. One evening at Mrs. Rodriguez house I learned to make Tostadas complete with homemade refried beans. There are so many ways to make frijoles refritos but to be honest I have no problem using a can of store bought refried beans. It is super quick and before you know it dinner is on the table. I do however, enjoy making my own tortillas. Corn or flour can be used. Traditionally corn is the tortilla of choice but flour will work. The tortillas can be baked in the oven until crispy about 8 minutes on 375 degrees for a less fat version. in the oil. If not the oil is not hot enough. Cook tortilla 30 seconds on each side until firm and crisp. Drain on a paper towel. Repeat with remaining tortillas. Meanwhile heat beans in a small pan. Stir in a little water, about 2-3 tablespoons stirring and mashing. Keep warm and moist. 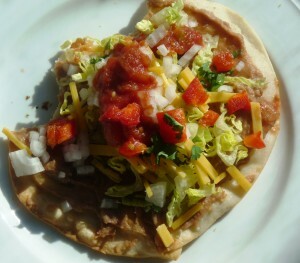 To serve top tortilla with beans, lettuce, cilantro, a squeeze of lime juice, cheese and then any other desired toppings. One of the most called for ingredients in a recipe is chopped or diced onions. If you have extremely sensitive eyes the tutorial on how to cut an onion without crying will provide a successful tear free way to chop onions.